Designer Con 2015 has a long list of available pieces, many of which will likely sell out before the weekend is over. 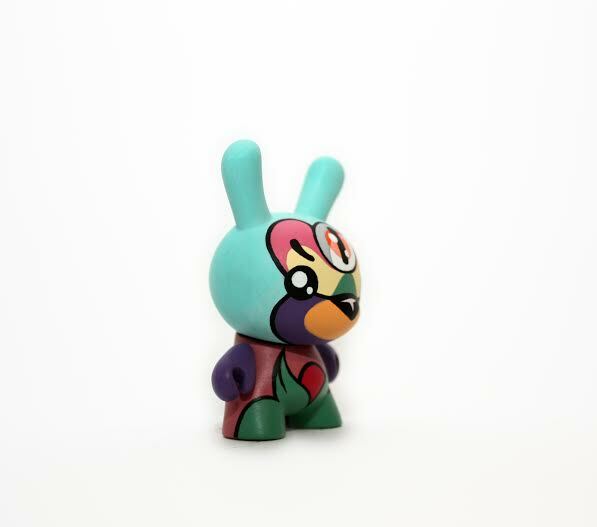 Recently featured by Kidrobot, Josh Mayhem will have a good number of his Blown Away styled Dunnys at the Kidrobot Booth #518. 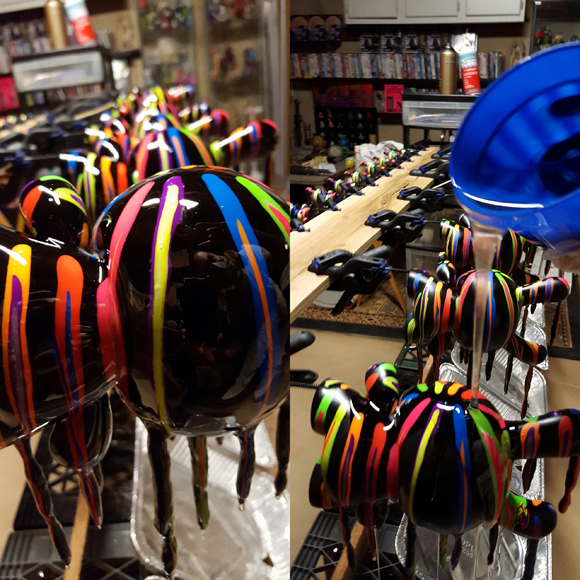 Several 8" and 3" Dunnys were given Josh's colorful application of paint drips over sculpted features. The end results are colorful Dunnys that look like the wind is blowing the paint right off the surface. 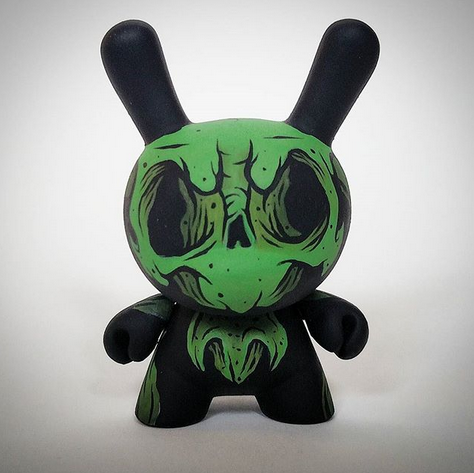 With the 8" Dunnys priced at $500 each, the 3" Dunnys fit into more people's budget with a price of $100 a piece. 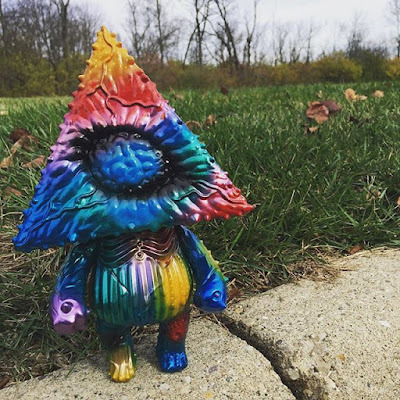 Josh's process was recently featured on Kidrobot's Blog, with some great pics and explanation from Josh, what it takes to create these amazing pieces. 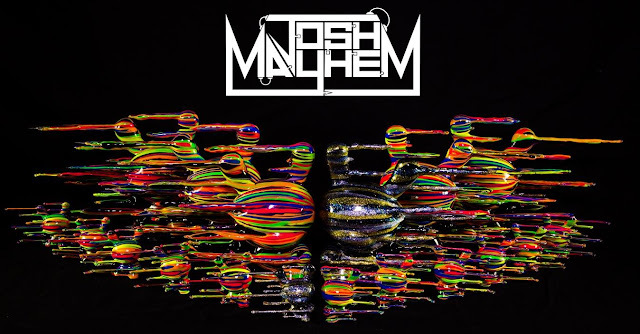 For those who won't be able to attend Designer Con 2015, Josh Mayhem is always open for commissions, so just get in contact with him and something can always be worked out. Designer Con 2015 will not only debut some sweet art toys and customs, clothes will also be on hand. 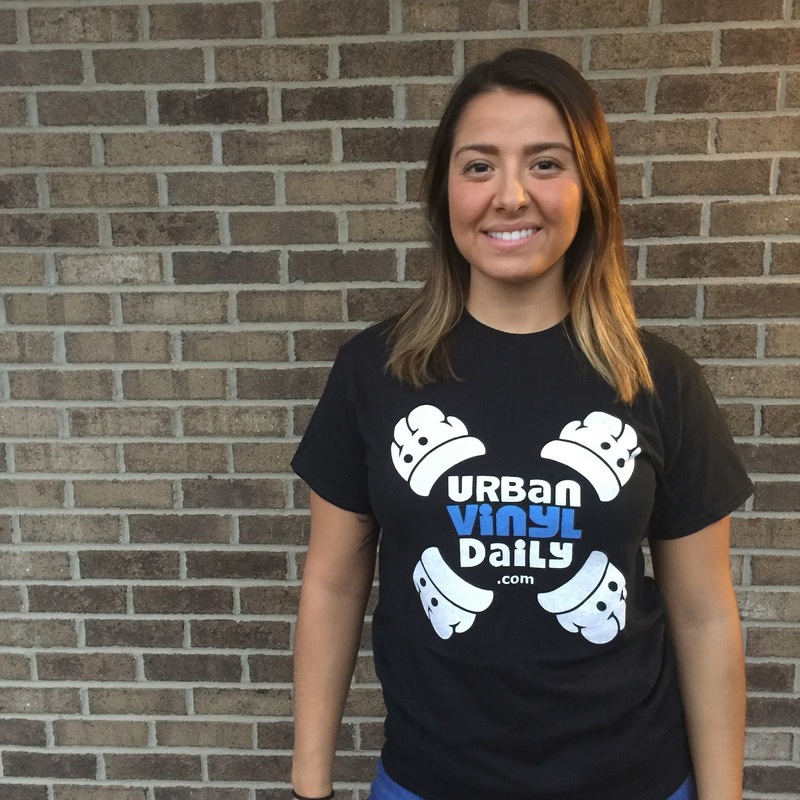 Urban Vinyl Daily will be releasing a few shirts, featuring their OG Hands Logo, created by JC Rivera. 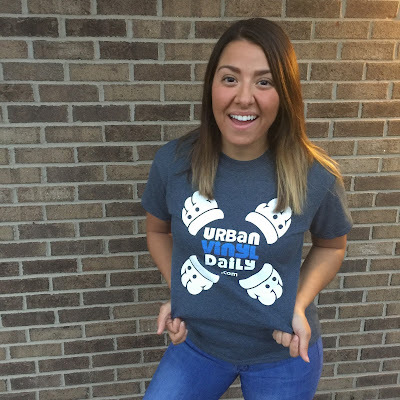 Available in two colors, there will be a limited quantity on hand at the Urban Vinyl Daily Booth #707. Priced at $15 each, be sure to pick up a shirt early, just in case your size is super limited. What happens when veterans of the toy industry come together to pour their vision into a concept whose time has come? Something BIG! Yuna is the very first doll in an all new line called Dream Big Friends. 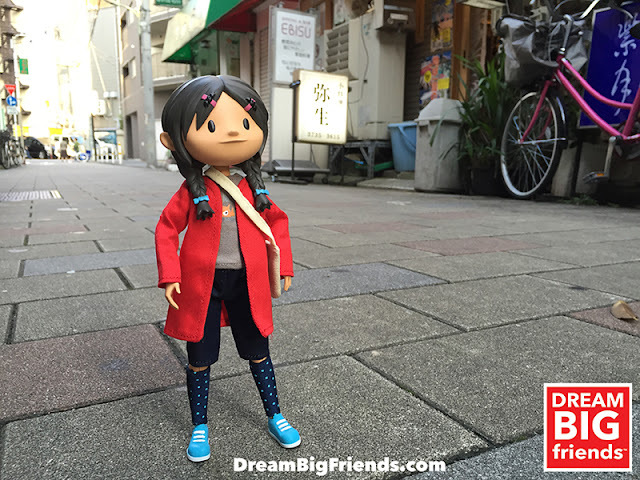 She's also the first Asian American girl to be the center of a doll line! 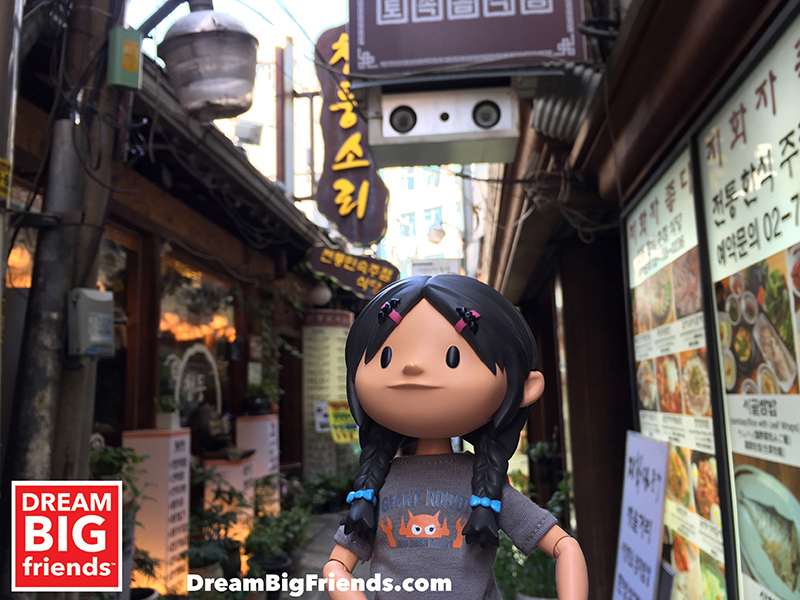 She loves science, travel, rockets, art, design, and Korean food. Her big dream is to run a company designing rockets that will one day take her to Mars. She'll be the first one to stand on the planet's surface, naturally. With your help, she’s sure to get there. November 20th (that's TODAY!) 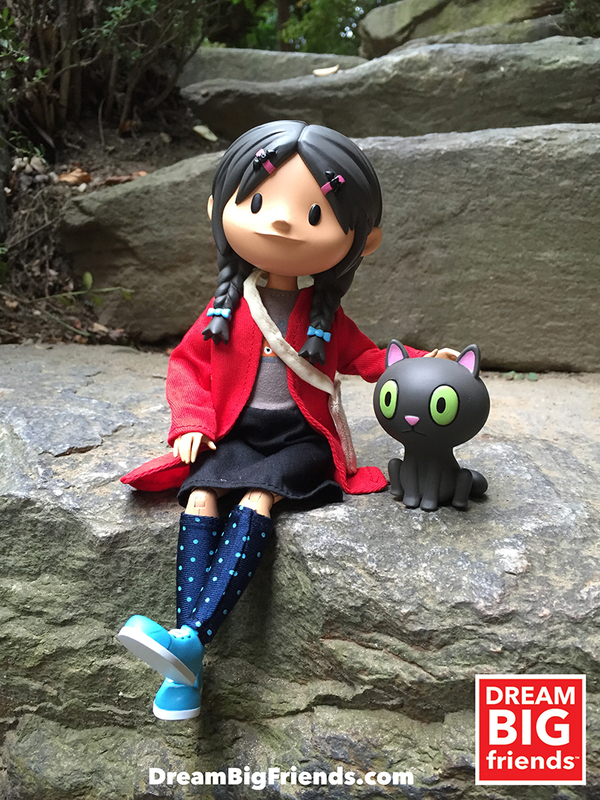 heralds the launch of a Kickstarter campaign for Dream Big Friends, where you can invite Yuna and her cat Kamata into your home. The 10" Yuna doll is fully articulated and comes dressed in sneakers, socks, a skirt, a Giant Robot t-shirt, a red jacket and a shoulder bag, packaged with her kitty Kamata as an accessory... all for just $40 + shipping. A killer price for a high quality 10" figure! There have been many discussions about body types and unrealistic proportions and attitudes imposed through children's toys these days. 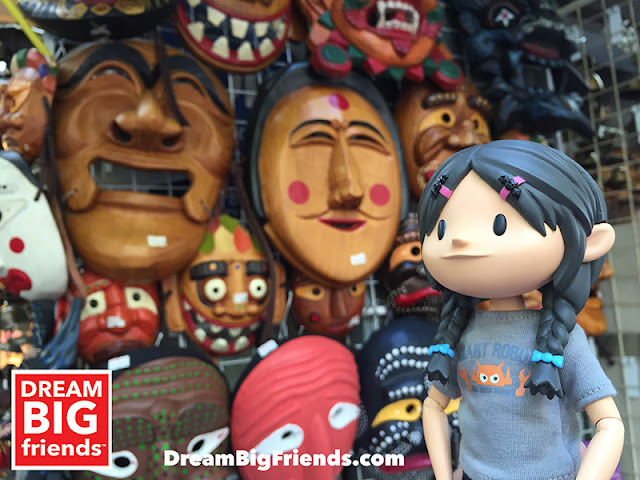 David, Sun Min and Klim wanted their first doll, and all of her friends, to feel like very real characters, complete with rich backgrounds and boundless potential... Avatars for your imagination. Made with high quality materials and built to last, our BIG Dream is that one day far from now, your kids will share Yuna with their kids. 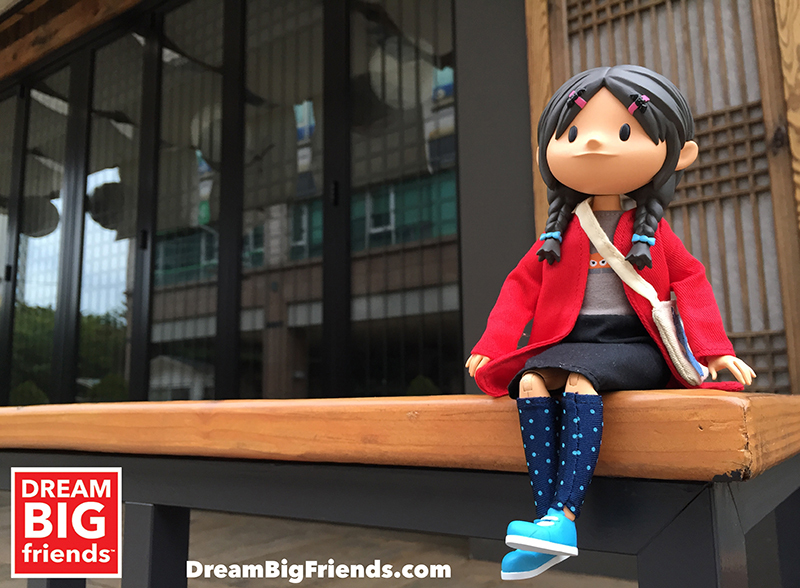 Yuna will be making her first appearance at DesignerCon November 21 and 22 in Pasadena, CA at the Bigshot Toyworks Booth #901. Where, conveniently, you will find Benny. Spread the word... and Dream BIG with Us! David Horvath and Sun Min are best known for creating and managing the Uglydoll plush toys and brand. 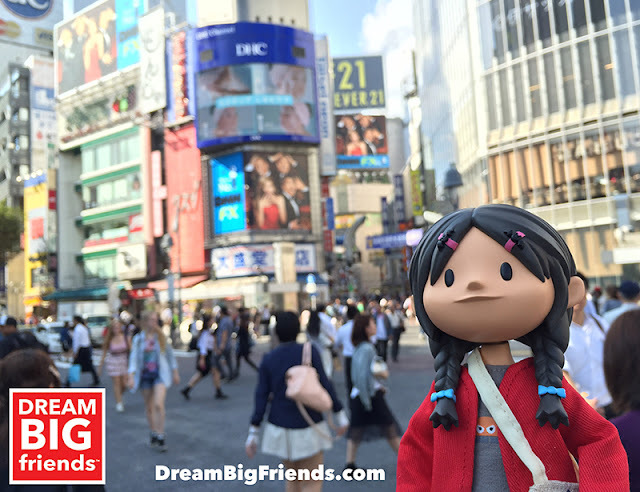 David is also the creator of the Bossy Bear children's book series, as well as the daily animated program "Littlebony " on NHK in Japan. Over the past decade, David has created and produced thousands of toys, books, and consumer products which have been available everywhere from the MOMA Museum in New York City and the Louvre in Paris to your local comic book shop. Klim Kozinevich is the Bigshot at Bigshot Toyworks, with nearly 20 years of experience in character-based product design for the toy and entertainment industries, with clients including Hasbro, Kidrobot, MTV, Sideshow Collectibles, Mondo, Fisher Price, CAA, Weta, and many more. From developing characters for award-winning toy lines and advertising campaigns, to overseeing the production of best-selling toys for mass market, Klim has worked and innovated in every area of the industry. At Bigshot, Klim is the creative lead and oversees all character design and development, earning the company a reputation for quality, reliability, and innovation. Bigshot's work can be seen in national print, and TV advertising campaigns, toy stores, and art galleries around the world. 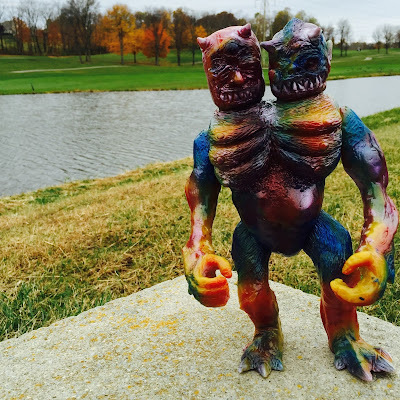 Chinese Artist KearJun is releasing a figure called GooDon at Designer Con 2015, through Urban Vinyl Daily Booth #707. Each hand painted figure features a unique colorway that highlights the details of the sculpt, while making each separate figure unique. Priced at $250 each, these pieces will come bagged with a header card and will be available on a first come, first serve basis. There is definitely going to be a lot of things available from Urban Vinyl Daily at Designer Con 2015, Booth #707. The Space Wanderer (Eric Wirjanata) brings back Perry The Sea Wanderer as "Golden Eye Perry", the fourth colorway from the series. Golden Eye Perry is a 6 inch resin figure that was designed by Eric Wirjanata (The Space Wanderer), sculpted by Win Satrya and originally produced by Plastic Culture. Painted by The Space Wanderer and Little Giant, Golden Eye Perry is limited to just 6 pieces. Priced at $66.80 plus shipping, these are available now through The Space Wanderer's online store. Urban Vinyl Daily is really going to have a lot of different customs at Designer Con 2015. Spanish customizer, WuzOne, painted up a couple of Dunnys that will be available through the Urban Vinyl Daily Booth #707. 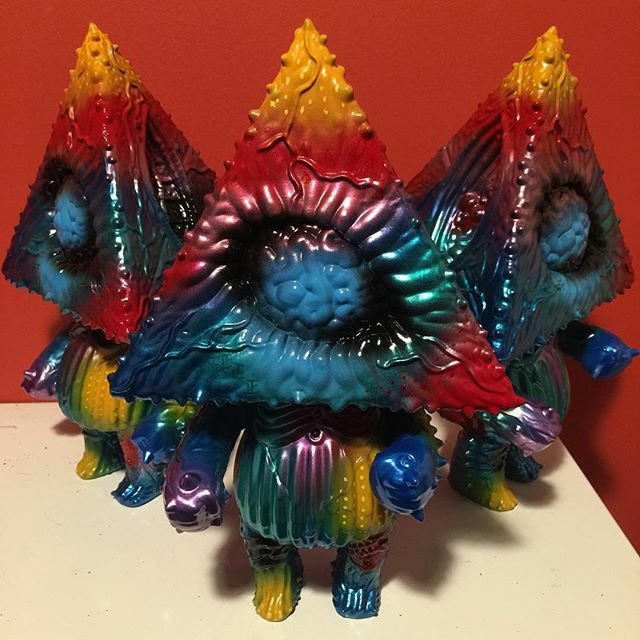 Featuring WuzOne's unique application of colors and lines, these customs will likely go fast. Priced at $80 a piece, these will make a great addition to any collection. 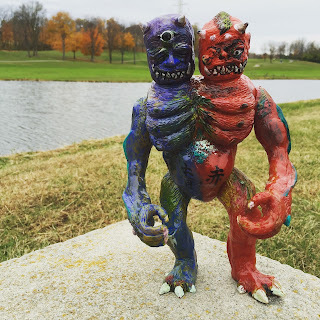 The Disarticulators' Tru:Tek released a special "Ofuda" Oozeball on Friday the 13th. Limited to just 5 pieces, priced at $65 each, these squishy white sofubi Ooze-It/Madballs were designed by Tru:Tek and sculpted by Zectron. Featuring a black rub and hand sprayed ooze, several colors were created, included a metallic rainbow colored Ooze Ball. Each "Ofuda" Oozeball comes packed in a linen drawstring bag with a special paper talisman for summoning the ooze god. Unfortunately, these are already sold out, so be sure to follow Tru:Tek and Man-e-toys to stay up to date with upcoming releases. "He comes from the deepest parts of the ghetto. He was visited by a space vampire, that was known as Darth Feratu. 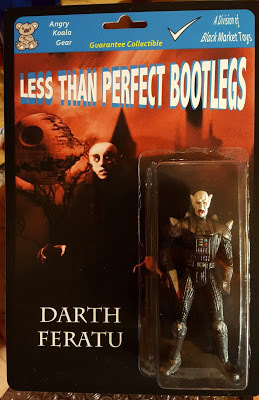 After bitten, Darth Feratu locked him away in a coffin. He eventually woke up on an alien planet in the clouds. He is now on a mission to find that jive blood sucka that turned him." 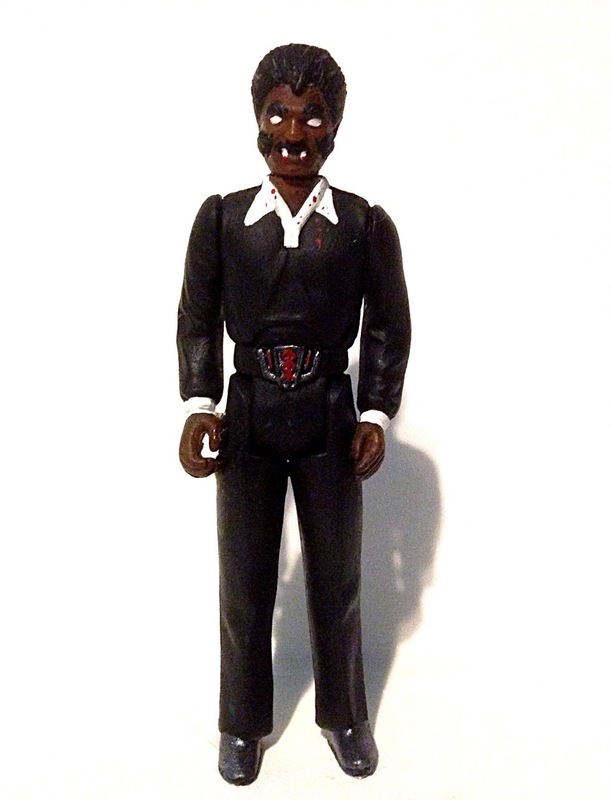 Fully painted versions of Blackula Calrissean will be available from the DKE Booth #812 for $40 a piece. 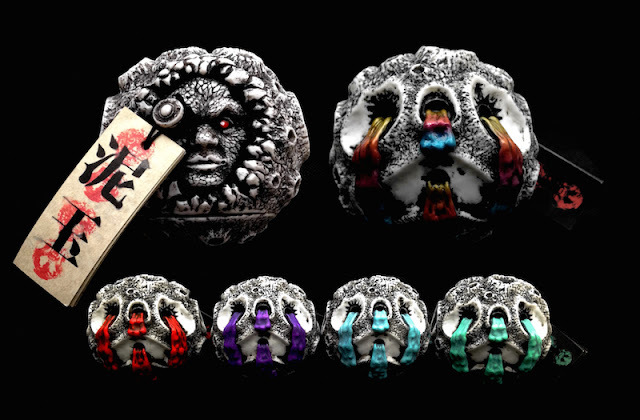 Fully GID versions are also going to be available, through Angry Koala Gear and Obscure's Booth #200, for $20 a piece. 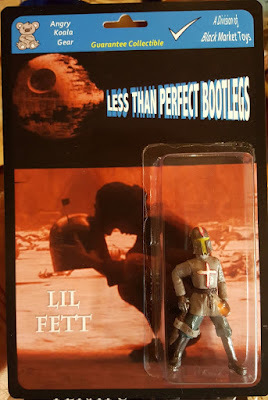 In addition to the Blackula Calrissean bootlegs, Obscure will have a few painted Darth Feratus and Lil Fetts for $30 a piece. Be sure to stop by Booth #200 and say hello. Designer Con 2015 is going to be packed full of exclusives, customs and people. 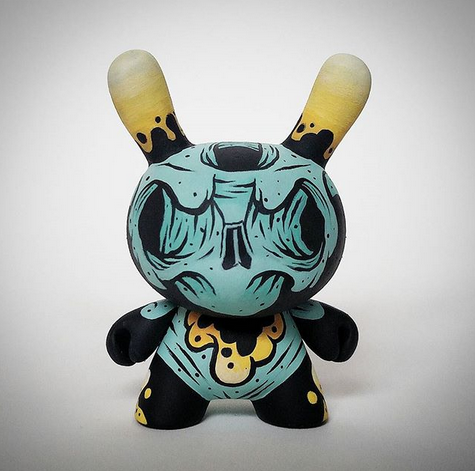 This year, artist Cat Atomic is going to have a few custom Dunnys at the Broke Piggy Booth, #723. 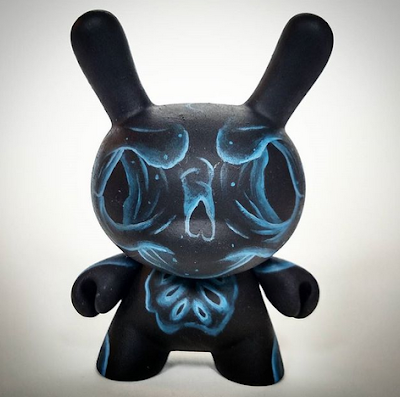 Cat Atomic painted up three separate Dunnys, which are going to be priced at $75 each. 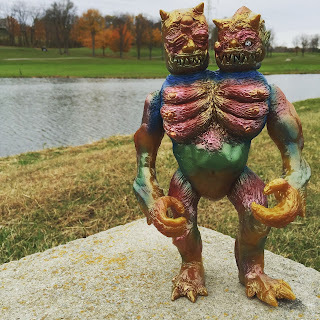 Be sure to stop by Broke Piggy's Booth during Designer Con 2015 and check out these Dunnys, as well as all everything else at Designer Con 2015. In the aftermath of an unknown event stands a 12-inch vinyl statuette. A lost life in a small metal cage lies at her feet with no explanation given. Limited edition of 200 pieces, each is hand numbered with the artist’s engraved signature on the bottom. Self taught artist and habitual doodler, Craww plies his trade from the fair city of Sheffield, drawing inspiration from daydreams, music, comics, nature, gin and an overactive imagination, Often starting in one place and ending up in another, his work poses questions but seldom answers them. It’s direction influenced as much by accident and a short attention span as design, Craww enjoys seeing his creations taking on a life of their own as he paints. Craww likes ambiguity and his work explores his fascination with things that aren’t quite what they seem. Pretty things in dark places, nasty surprises masquerading in beauty, hidden stories and happy accidents, brought to life with a mix of elegance, balance and disciplined chaos. 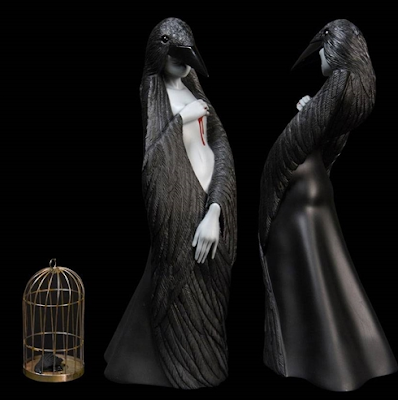 His work is a story without an end – a stream of consciousness ramble through the woods, populated with skulls, crows and melancholic girls with big hands. *NOTE* International orders may incur additional ship costs, we will work with you to achieve best pricing that makes sense for your order. 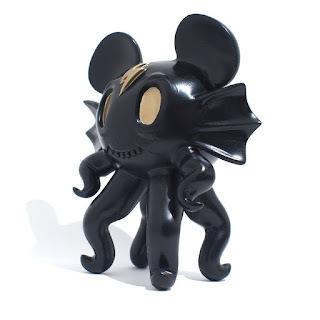 Preorder KIDROBOT BLACK MURDER BY CRAWW today! 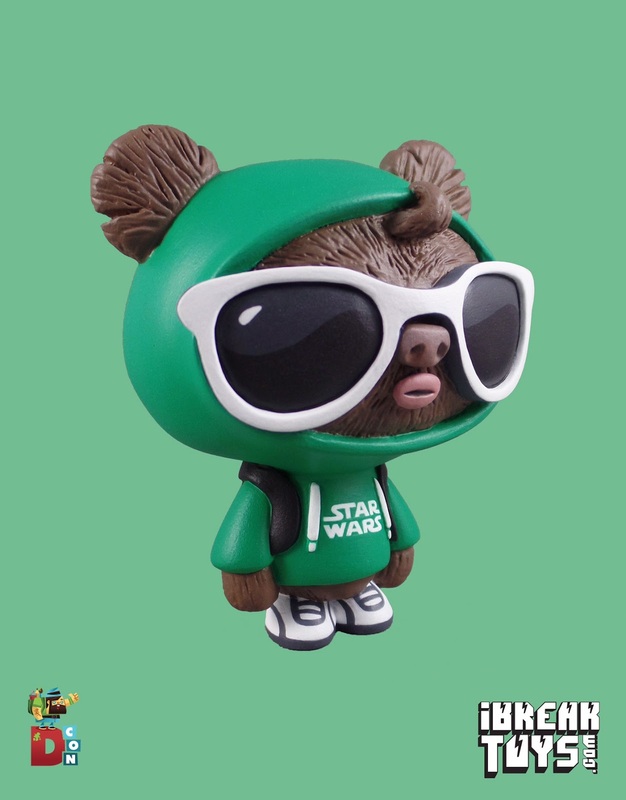 This is a custom Geekwok, from Lisa Rae Hansen, for Ume Toy's custom show at DKE Toys booth at Dcon this weekend. 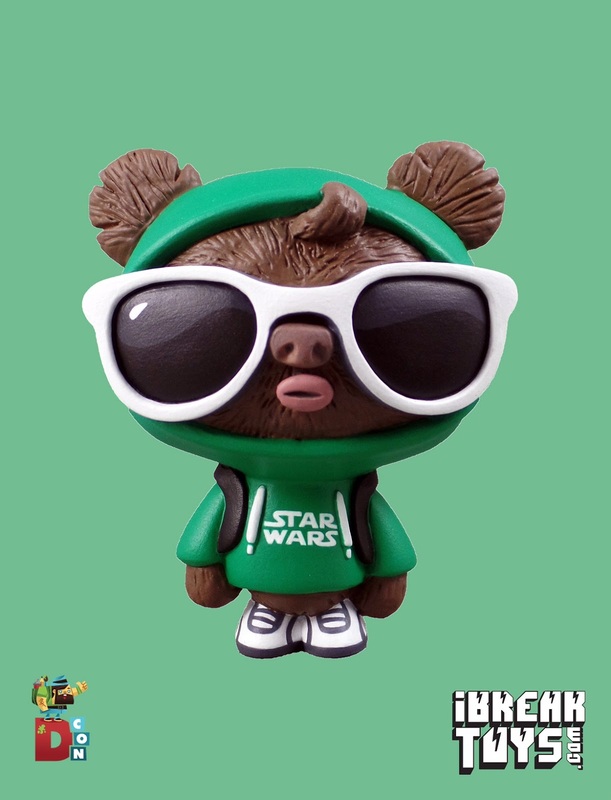 It's called, "May The Geek Be With You" a playful take on the Geekwok, he's an Ewok who's a massive Star Wars fan/geek, who's off to the Toy convention under cover of sun glasses and a hoodie in the hopes that he doesn't get spotted and hounded for autographs. By far the most magnificent Kidrobot Black creation ever conceived, this visionary vinyl towers at 20 inches from hoof to horns and celebrates the life and love granted by the eternal Mother. Exquisitely rendered in matte vinyl and embellished with gloss-touched details, Doze's latest depiction of the symbol of fertility will have you in awe of her organic-mechanized mythic form. Encased in luxurious black and gold quarters bearing Doze Green's signature in gold foil, this striking sculpture is limited to only 200 pieces worldwide. With a restricted color palette, the exclusive collection of KR Black thrives on the untried, the unexpected and the unusual. Featuring darker themes and available in only limited quantities, KR Black distinctively unites higher and lower forms of expression as it draws production to the brink of unique. 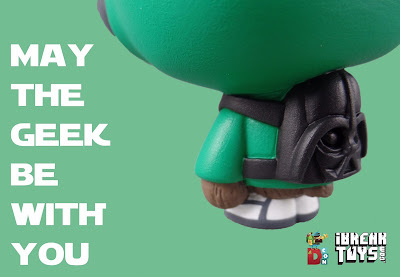 Preorder KIDROBOT BLACK GODDESS BY DOZE GREEN today! Impending doom has never looked so freakin cute. 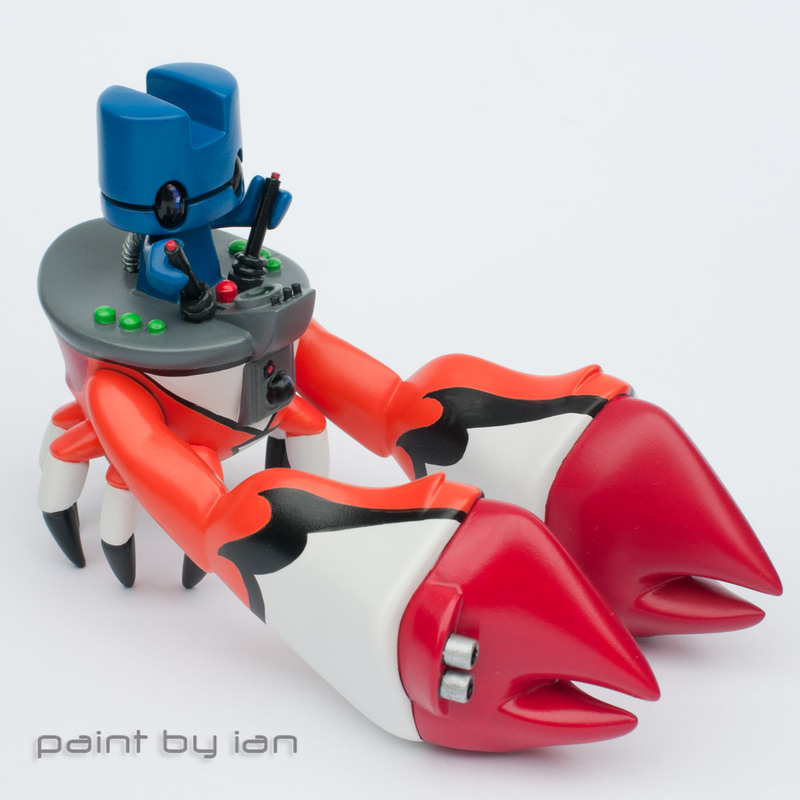 Instagram's @Paintbyian has come out of the gate with his first custom vinyl toy for Martian Toy's Space Crab Wars for Designer Con 2015. Team Europe certainly has a strong contender in this one; that little Lunartik is poised to fire the big guns. I love the clean machined finish of the sculptural additions and paint application- not a seam in sight. Check out Martian Toy's booth #603 for the full exhibition of Space Crab Wars at Designer Con 2015. For more of Martian Toys offerings, follow along here, and check out PaintByIan's painted racing Helmets & Car body shells here. 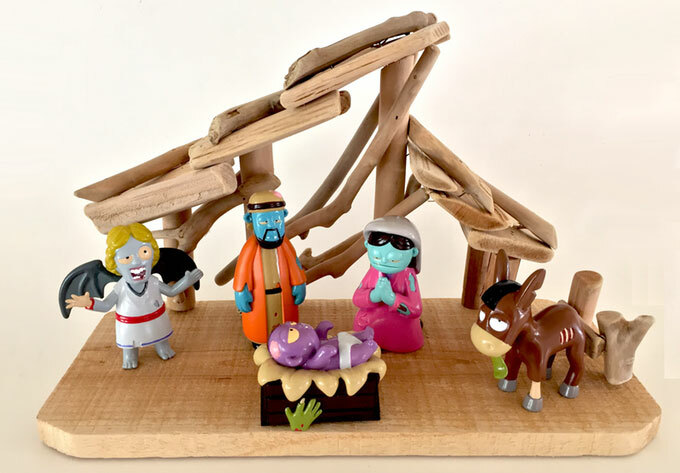 NerdTalk Toys, LLC is excited to announce the launch of The Zombie Nativity, a vinyl desktop collector set that includes zombie versions of Jesus, Mary, Joseph, the Angel and an undead Donkey, on the online crowd-funding platform Kickstarter. Perfect for Halloween, Christmas and even Easter, The Zombie Nativity is a great way to put your own spin on the holidays. The Zombie Nativity is sure to top any list of the weirdest and best Christmas gifts. The official Kickstarter launch date for The Zombie Nativity is November 14th. NerdTalk Toys, LLC believes The Zombie Nativity is the perfect geeky holiday décor for any fan of trending zombie television shows like AMC’s The Walking Dead or CW’s iZombie. “With the undead being so popular right now, the Zombie Nativity is perfect for your home, regardless of your religious views,” suggests Ashley Gojic, CEO of NerdTalk Toys. 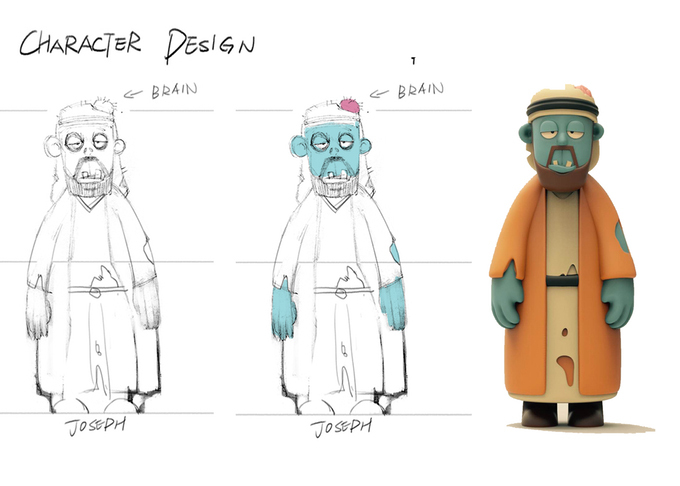 The Zombie Nativity will be available for order on Kickstarter starting November 14th, and sales will continue until the eve of Zombie Jesus’s birthday, December 24th. NerdTalk Toys will produce the Zombie Nativities in Q1 of 2016 and will distribute just in time for Easter 2016, or, as they like to call it, Zombie Jesus Day. 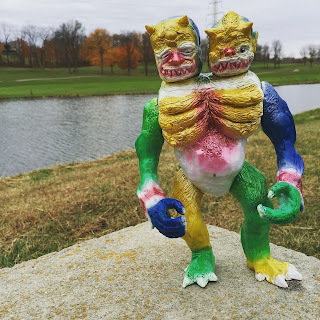 To purchase your very own Zombie Nativity, visit their Kickstarter page at https://www.kickstarter.com/projects/zombienativity/the-zombie-nativity . NerdTalk Toys, LLC is a startup toy design and manufacturing firm in Phoenix, AZ. Founded by owners Ashley Gojic and Justin Contre, NerdTalk Toys aims to create geeky and collectible toys for children and adults of all ages. 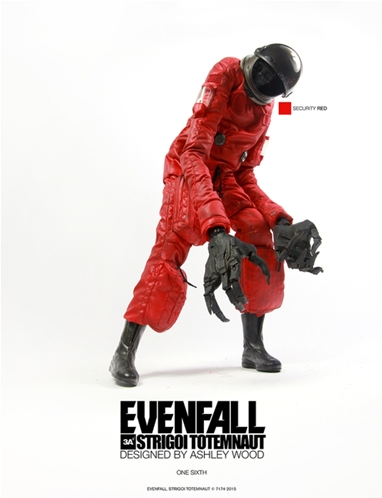 Preorder 3A EVENFALL STRIGOI TOTEMNAUT – SECURITY RED RETAILER EDITION today! Clutter Gallery's current exhibit is "Nihonsei", a show featuring Japanese based and born artists, highlighting the diversity and quality found in the Land of the Rising Sun. 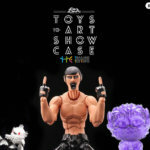 Featuring works by Kenth Toy Works, Leo Sofvi Bouya, Rampage Toys, RESTORE, and Uamou, this show has a ton of amazing pieces. Although a lot of pieces are already sold out, there are still a good number of pieces available online, through Clutter Gallery. All works will be on display at Clutter Gallery until December 4th, 2015. So, for those in the area, stop by and check out these works in person. 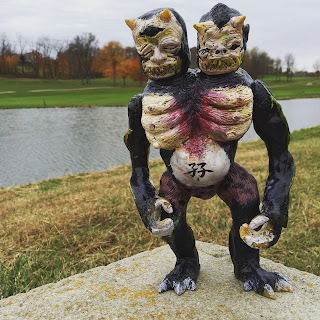 To keep the releases coming, Urban Vinyl Daily has teamed up with Toysbian to release a limited run of the artist's SanJiaoMo soft vinyl figure at Designer Con 2015. This colorway features a mix of blue, red, yellow and green, in a variety of shades. Limited to just three hand painted pieces, each come bagged with a Toysbian header card. Available at the Urban Vinyl Daily Booth, #707, each piece is priced at $135. Definitely a colorful addition to any shelf. At Designer Con 2015, Martian Toys (Booth #603) will be hosting a group art show called Space Crab Wars. 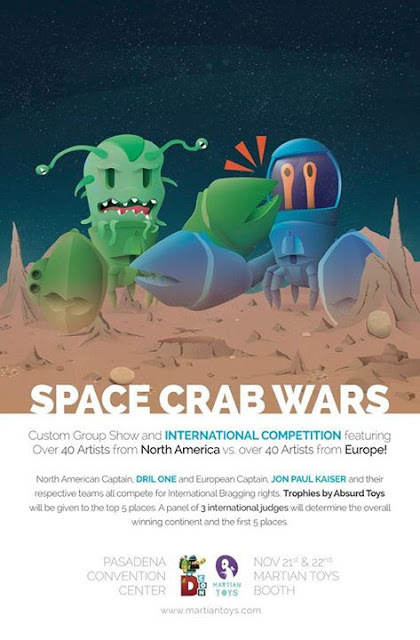 Featuring custom Space Crabs by artists representing North America and Europe, Designer Con 2015 will be the venue where 3 international judges will determine 5 top customs, as well as the winning continent. Infinite Rabbits' contribution for team North America is titled "4...3...2...1...". 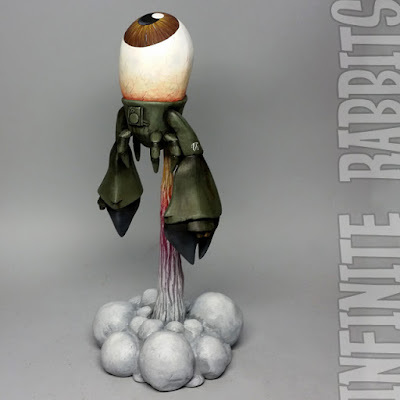 Taking orbit, this custom Space Crab will perform it's orbital reconnaissance duties for the upcoming battle, his eye will see all. 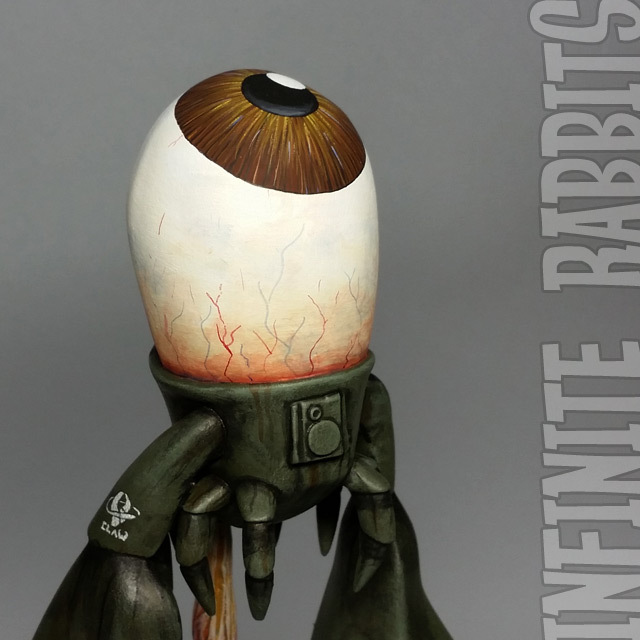 Those attending Designer Con 2015 should stop by Martian Toys Booth #603 and check out this Infinite Rabbits custom, as well as all the other customs in the show.